Have you ever wished there was one central location where you could get key data, scientific guidelines and other relevant information on pregnant women and oral health? So have we. Well, wish no longer because that location is here: www.pregnantwomenoralhealth.org. 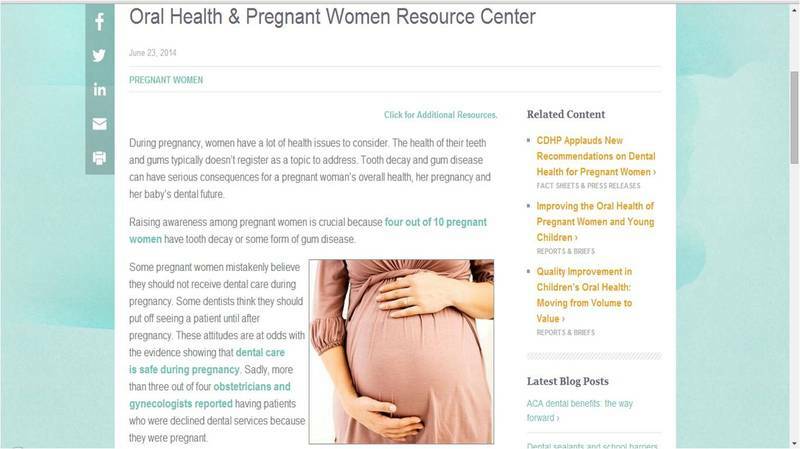 The “Oral Health & Pregnant Women Resource Center” was created by the Children’s Dental Health Project not only to share information beneficial to oral health professionals, but to encourage expectant mothers and their loved ones as well. It’s a two-way street, and we made sure we looked both ways before crossing to the other side. Approximately 40% of pregnant women have a decayed tooth or infection in their gums. Did you know that currently eight states have policy guidelines for the oral health treatment of pregnant women? Our thanks to the American Dental Partners Foundation for funding the creation of this resource center. Don’t be surprised if the look of this resource center changes over the coming months. We’re constantly looking for new information to enhance the page. If there’s something you’d like to see, please send us a note.